The Canadian Islamic Center- Al-Jamieh (CICAJ), is a non profit Islamic organization located in Montreal, Province of Quebec. It has a mission, to serve, educate, engage and empower the Muslim community to become active in religious, social, cultural, economical and political areas of the Canadian society. The CICAJ is committed to promote strong Islamic values and unity among the community and to enlist the help of talented and committed individuals to ensure high standards in delivering various services to the community. In 1991,a group of Syrian professionals and business men purchased the building at 416 Neptune Avenue, Dorval. It was formerly a church belonging to Jehovah's Witnesses. This was relatively a new building and accommodated about two hundred people in prayer. About 90% of the congregation consisted of Arabs, and 10% of other ethnic origins (Indo-Pakistan, Turkish and Bosnia etc). With time, the numbers increased tremendously for Friday Prayer, especially during the Summer when the youth of the community joined the congregation prayer. 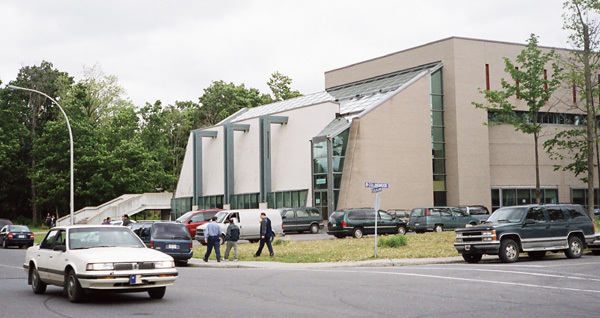 In 2002, an opportunity presented itself to the management to acquire a very large institutional building in Dollard des Ormeaux; the Al-zahara Foundation (Iraqi Shia Organization) wanted to sell this building (see photo, this page). With Allah's Blessings, CIC Al-Jamieh purchased this building situated at 241 Anselme Lavigne, Dollard des Ormeaux. This building has a very large hall that can accommodate over one thousand people in prayer. The basement has a number of classrooms, meeting rooms and a large office. After some modifications (installation of traditional custom design carpet and mehrab), this building opened to the congregation for Eidul -Adha prayer in 2002. Presently this is the best and the largest mosque in Montreal. It is a large rectangular structure and the main floor is raised from the street level by about twelve steps. There are two entrances to the building, one reserved for ladies. There is a large entrance hall, a cloak room and separate washrooms, place for Wudhu (ablution) for men and women. From this entrance hall, there are doors to enter the main mosque area with very high ceiling. There is a mezzanine floor off the entrance hall towards the front and is used for meetings and youth activities. The finished basement is divided into classrooms, conference rooms, recreation room and an office. There is a fully equipped kitchen on the main floor. The entertainment, serving of refreshments and dinners is done in the basement recreation area. Providing a place of worship (masjid) for the Muslim community. Providing a place for various training sessions in the areas of religion (Quran and Sunnah), science, Arabic language and other skills. Promoting unity and brotherhood among the Muslim community. Strengthening relations between the Muslim community and other Canadian individuals and cultures. Making Islam better understood as a complete way of life. Organizing religious and social activities as permissible in Islam. Providing help and guidance to new Muslim immigrants to settle in Canada. Accommodate and welcome new converts to Islam. Making the Canadian Islamic Center al-Jamieh self sufficient. The affairs of the Corporation are managed by a Board of Directors comprising of 11 members; seven are elected by General Assembly, two are appointed by the Board of Trustees, and two by the Board of Scholars. The Board of Trustees members are those who have directly participated in the formation of the Corporation and whose names appear in the letters patent. They are eleven in number. The Board of Scholars consist of active members who are knowledgeable in Islam and are accepted by the active members. They are five in number. Active Members are those in good standing, who have paid their membership fee. The Board of Directors appoints Executive Officers, Secretary and Treasurer to carry out day to day running of the organization. External Auditors (Financial and others) are appointed by the Board of Directors and report to the General Assembly. Imam: the Board of Trustees and the Board of Scholars propose three names for the consideration of the General Assembly and one of them is chosen. 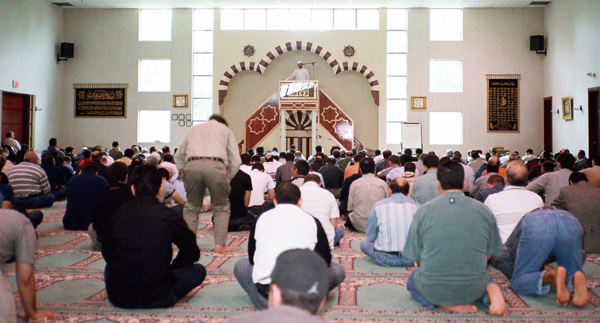 Khutba (address) accompanying Friday congregation prayer (Salatul Jumu'a) is in Arabic with a brief English translation before the start of the prayer. It certainly is not the best or effective format in Canadian context. However, it should be noted that ninety percent of the congregation is Arabic speaking, so khutba in Arabic is quite appropriate. A large number of women come for the Friday congregation prayer and pray in an area at the rear of the main hall behind a low partition.